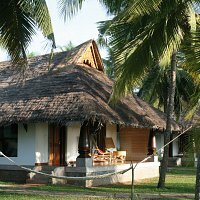 A unique retreat hotel in Northern Kerala. An oasis of calm set in twelve naturally landscaped acres, Neeleshwar Hermitage is built according to the traditional architectural principles of Kerala Vastu. The whole site oriented to the east and the rising sun, while the buildings are all placed in correct relation to each other, the four directions and the site as a whole. The traditional wood-and-thatch architecture is balanced with stylish contemporary touches and familiar modern comforts. The site overlooks a gloriously unspoiled beach of sand, stretching as far as the eye can see in both directions. The sea is clean and safe for swimming most of the year. Our sensitive and attentive staff offers Keralan hospitality with unparalleled attention to detail. From the signature coconut drink that greets your arrival to the smiling faces genuinely sorry to see you leave, everything here is carefully and subtly designed around your personal needs. Northern Kerala, traditionally known as Malabar, is a jewel awaiting discovery. 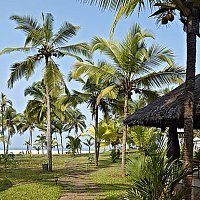 Empty beaches fringed by coconut plantations, peaceful inland waterways and lush hillside spice gardens are features of an undisturbed rhythm of life set against the immensity of the ocean. The Hermitage is approximately two hours from Mangalore international airport and between four and five hours from Calicut international airport. It is directly linked with the rest of the state by air, road and train. Many of our guests are intrigued as to the origin and meaning of our name. The name derives from the hermitages (with or without resident hermits!) built by Renaissance princes on their country estates the better to commune with God. In later times the term was applied by Louis XIV the ‘Sun King’ of France – and other monarchs – to country residences where court ceremony and formality were abandoned in favour of the simple life. Peter the Great imported the idea to Russia, building a ‘Hermitage’ in his country palace at Peterhof and using it for private entertainments. His successor, Catherine the Great, built her ‘Hermitage’ pavilions onto the Winter Palace, the principle residence of the Russian Tsars, so as to be able to entertain her friends and lovers in private. Since she housed her extensive art collections there, the name soon came to refer to what has long been the world’s greatest museum, The Hermitage in St. Petersburgh. Here in Neeleshwar Hermitage, we like to think we are continuing a great tradition. We aim to make all our guests feel like royalty and to do our best to look after them in aesthetically pleasing surroundings that are relaxed, carefree and highly civilised. Come and discover your inner monarch! a perfect place to find your inner peace and yourself. Felt like home and the staff nurtures and takes care of you without being obtrusive. Thank you - we will see you again!’"
"Neeleshwar represents, really, the perfect distillation of what so many Westerners, from E.M.Forster and Allen Ginsberg to the Beatles, have come to India in an attempt to find: an escape from the pressures and frenzied pace of our lives. The transition from stressed-out to blissed-out, however, is surprisingly swift...in just a few days, I am barefoot, loose-limbed and clear-headed, with a sensation of wellbeing that, I later discover, I carry with me long afterwards"